I just love Osso Buco, and my family does as well. 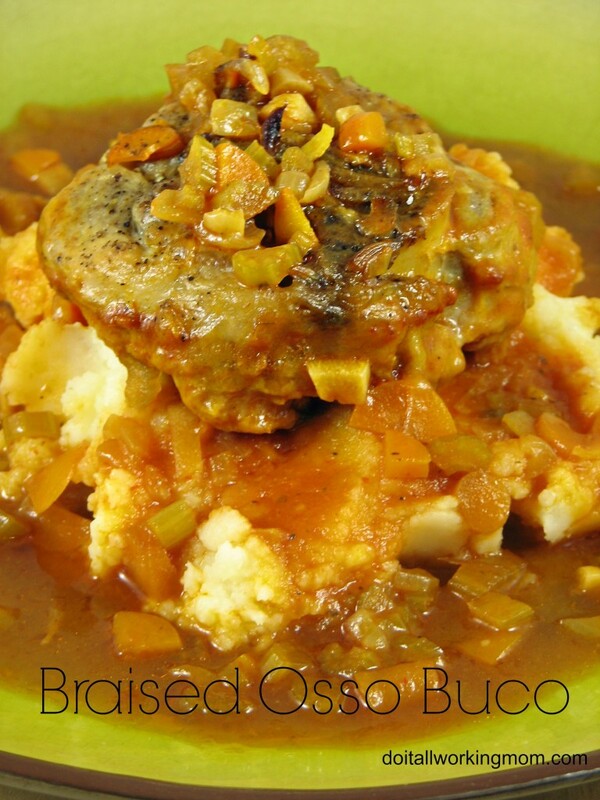 I always did my Osso Buco in the Crock-Pot; you can see my Crock-Pot Osso Buco Recipe Here. The other day I had a really busy morning, and forgot to prepare and start my Osso Buco in the Crock-Pot. I had unthawed the pork shanks and I really wanted to eat that for dinner, so I decided to try my recipe in the oven. Well that was a great idea! It was simply AMAZING!!! You definitely need to try this Braised Osso Buco recipe. In a large frying pan, heat the olive at medium high heat. Coat the shanks with flour, season with salt and pepper, and brown them on each side until golden brown. Place the shanks in a large oven save dish with lid. In the same frying pan, soften the onion and garlic (add more olive oil if needed). Deglaze with the white wine and pour over pork shanks. Add the rest of the ingredients with the pork shanks and season with salt and pepper. Cover and cook for 3 1/2 hours. Check a few times and add water if needed during cooking. Cover and cook for 3 1/2 hours. Check a few times while cooking, and add water if needed.